This is easy to use, easy to apply and quick drying (1-2 minutes a coat). It's a really nice silver shade that would be great for stamping! Unfortunately I got cat hair stuck in it when I was painting! Hadn't realised until I saw the photos :-| So apart from that it's great!!! It's a smaller bottle but the brush is really good. It's so shiny and it lasted well. Lovely indeed! 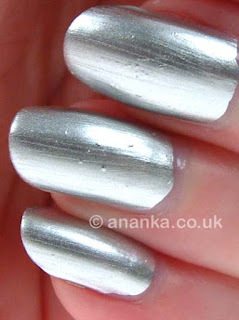 This is a very pretty silver nail polish indeed. I think its worth the try. Oh really cute nail polish color. kisses! Have a great week!!! Ah the cats hair, it's everywhere, in my home too :D Pleasant silver, I like them for stamping! Silver does look rather good! Nice silver, looks great on you.